At Kimberley visitors can view a 17-minute movie about the location and the history of diamond mining in Africa. They also get to walk out on a high platform to view The Big Hole, take a ride down a faux mining shaft, enter a locked vault to view genuine diamonds of all colors, and visit a small museum. There is also a café, gift and jewelry shops, and many structures and artifacts left from the days when Kimberly was a thriving mining town. Visitors can walk the eerily empty streets of the company town and step into the modest home where the De Beers family lived. 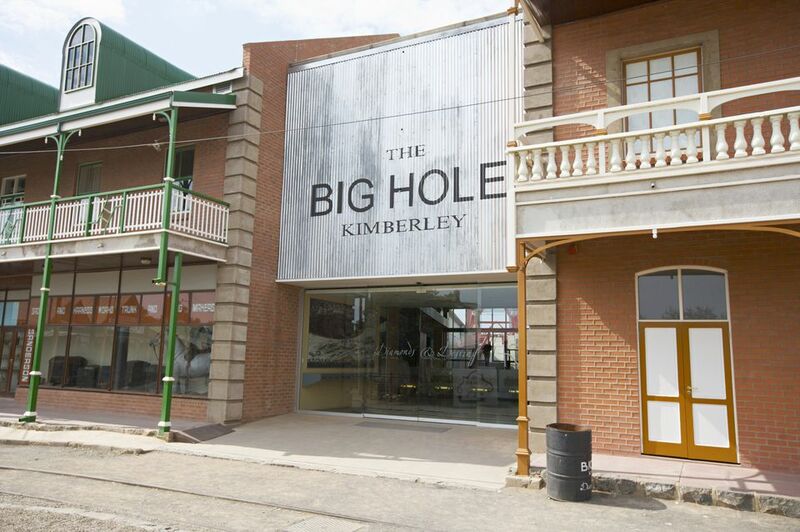 Those who arrive at Kimberley’s Victorian railway station by train then travel to The Big Hole via motorcoach, about a ten-minute drive. Nearly 15 million diamonds were extracted from the Kimberley Diamond Mine, discovered in 1871. Excavation ended in August 1914. 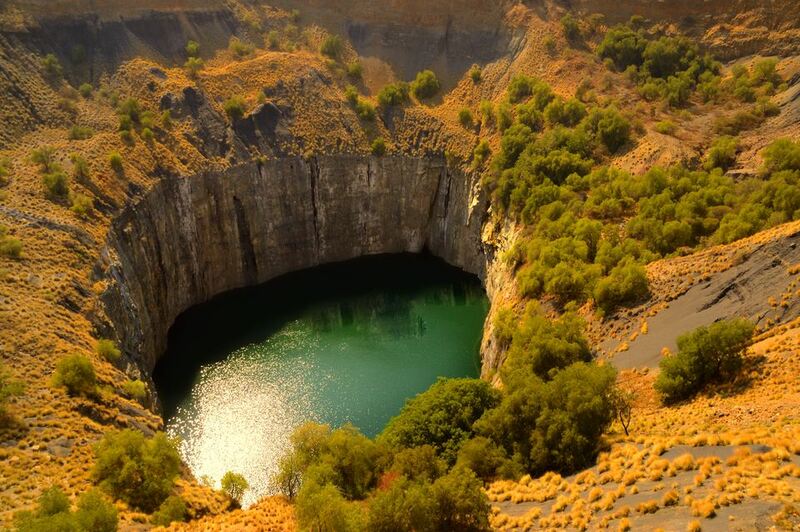 That's deep: The Big Hole is 215 meters, or 705 feet, deep. This map helps visitors to understand the facilities they can explore around The Big Hole. They include original and recreated structures from when Kimberley was a working mine with a town that served its residents with a variety of shops and other necessities. Rusted now, this was one of the machines in use during the heyday of diamond mining in Kimberley. The Kimberley Diamond Museum tells the story of the history of diamond mining and presents artifacts from the early days. Many visitors wonder if free samples are available. They are not. The discovery of diamonds brought not only miners but also tradesmen to Kimberly, and a town sprouted at the end of the nineteenth century. Although slavery was abolished in the Cape Colony in 1834, most of the miners did not live much better than those who had no freedom. According to the sign, "This house was prefabricated in England in 1877, conveyed from the coast to the diamond fields by oxwagon and erected at 14 Pneil Rd. First registered owner, Mr. A. J. Petersen." Johannes De Beer was an Afrikaner upon whose farmland diamonds were discovered. He is buried in Kimberley. Once an important part of the diamond trade, this one-room office was where diamonds found in Kimberley were purchased and sent overseas for cutting and sale. Little of the riches dug from the Kimberly mines benefitted South Africans; most of the treasure was sent overseas.